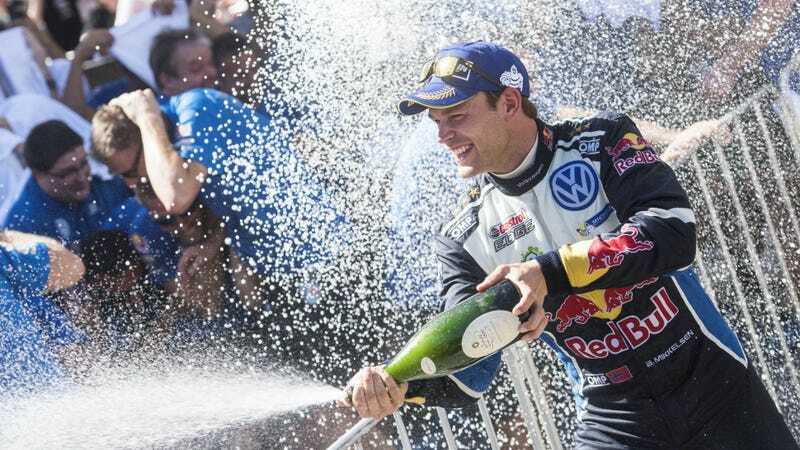 One of the biggest travesties of the Volkswagen World Rally Championship team shutting down was that it left its very last rally winner, Andreas Mikkelsen, without a ride for 2017. His more experienced teammates Sébastien Ogier and Jari-Matti Latvala easily landed on other teams, but Mikkelsen was out of top-level work. Finally, thanks to a one-off drive with Citroën at the upcoming Rally Italia Sardegna, we’ll get to see what Mikkelsen can do behind the wheel of a top-level 2017-spec Citroën C3 WRC car, reports the WRC. Mikkelsen’s been picking up rally drives where he can all year, except they’ve been in the lower-level WRC 2 series, which acts as a sort of feeder series to the main WRC. It’s rally’s equivalent of having to go back and run Indy Lights after a decent IndyCar season, or doing Formula 2 after winning in Formula 1. And it hurts to watch! At Rally Portugal, Mikkelsen had built up over three minutes of lead in front of the rest of the WRC 2 field before a crash took him out of contention on the final stage of the rally. Rally Portugal crashed a lot of cars, and Mikkelsen was clearly pushing it, as you know he’s thirstier than thirsty having to compete in a feeder series, so I’ll focus on the stat before that untimely crash: over three minutes of lead. Usually leads are measured in seconds or maybe a bit over a minute, but three or more minutes is pretty dominant. I spent most of the rally cursing Dieselgate for spitting Mikkelsen out of VW’s team too late to land a ride in the main WRC show. This is not a sanction of any kind, nor does it call into question our investment in the young drivers. The decision is merely intended to maximize Citroën’s chances. Stéphane accepted that it was necessary to put the team first in this case. Mikkelsen has more experience at the rally than the rest of the team, as the Citroën team didn’t do Rally Italia Sardegna last year. That being said, there’s already talk of Mikkelsen doing more with the Citroën WRC team as part of a longer-term agreement, the WRC notes. The only question left there is where that will be in this year’s already-full WRC grid. It sounds like someone, somewhere might be losing a seat or going to another team. We’ll see!